The History Podcasting Platform [HPP] is the place for budding history podcasters to come and gather. This grassroots movement was initiated by yours truly to provide a genuine platform of support for new history podcasters, and to encourage those skeptics to begin their history podcasting journey. Q: What's all this then? A: The History Podcasting Platform [HPP] is a free service available to history podcasters at any stage of their journey. I will commit to helping you wherever I can, and I will be providing resources in this section of the website and in the newsletter on a weekly basis. Q: So history podcasters who have been going for a while can gain something too? A: Absolutely, and I'd be happy to help anyone at any stage wherever I can! I can't come up with your idea for you, but I can help you make a podcast about it a reality. Q: Is this a network? A: The HPP isn't a network, it's more accurate to think of it as a think tank where you can gain insights and advice from someone who has been doing history podcasting for six years. Q: Where can I get more content about this? A: The HPP is updated weekly with blog posts, and these will be posted below and can be found on The Vassal State blog home, but if you're looking for extra tips on history podcasting which you won't find anywhere else, make sure to sign up to the newsletter, which delivers news about WDF to your inbox every Saturday, among other goodies. Q: Is it really free? What do you gain out of it? A: Yes it is absolutely free! What I gain is the satisfaction of knowing that I helped another quality show come into being, and I gain the benefits of association with you as your star rises through the history podcasting ranks. I want to make history podcasting a viable and recognised alternative to other forms of history education, and the best way I can do that is to leverage the advantages I have at this stage of my history podcasting 'career'. A: Your best bet is to email me wdfpodcast@hotmail.com but you'd also be wise to check out the When Diplomacy Fails Facebook group, since I'm treating that as a place not just to house my podcast's stuff, but also to jolly aspiring history podcasters along and introduce them to new fans and other veterans in the field. Q: I want to donate to further the cause of the HPP - how do I go about doing that? A: When Diplomacy Fails Podcast's budding podcast network (completely unofficial) is forever linked to the HPP because the two things are both my babies, and history podcasting is as important as my own history podcasts are to me. For that reason, supporting WDF on Patreon will have a similar impact to supporting the HPP with a recurring donation. Thankss so much for considering it, I really appreciate your support! Email: wdfpodcast@hotmail.com using the subject HPP to draw my attention. Facebook group: we'll be talking about all things HPP at WDF's official FB group, so make sure you join us! Introduction to History Podcasting Platform. Part 3: 'Why It's Important To Ask For Help' with Chris from the Age of Victoria Podcast. Part 4: 'Ignore The Assholes, Kill That Content'. Download this guide on how to reference and why you should be referencing here. This is a list of history podcasts which the History Podcasting Platform played some role in helping to establish, however large or small. This list will be a testament to the success and importance of the movement, and I can't wait to get started! The History of Vikings by Noah Tetzner. Subscribe to Noah's brilliant show on iTunes! DESC: The Vikings were a truly legendary people. For nearly 300 years they ruled the waves of the Northern Seas and raided peaceful monasteries and towns along the coasts of England, Ireland, Scotland and France. As raiders the Vikings had an infamous and beastly reputation. Pillaging, burning, and killing whatever lay in their path. They would stop at nothing to appease their desire for wealth and glory. But apart from being excellent at raiding, the Vikings established a trading network that stretched from Finland to Newfoundland, successfully besieged the greatest, most heavily defended city in the world, discovered North America, and revolutionized the way that we build ships. Not to mention the vibrant myths and sagas they told that are still capable of inspiring us today. 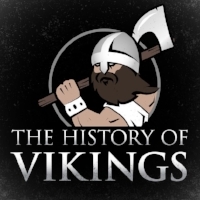 The history of Vikings is a rich one, and I hope you’ll join me in rediscovering it! Human Circus by Devon Field. Subscribe to Devon's brilliant show on iTunes!